Even if you’re not mentally anxious about presenting in front of a group in your mind, your body might not always feel that same sort of calm and ease. The way you breathe while presenting can impact your voice projection as well as your perceived confidence and comfort in front of a group. Increased heart rate, your mind going a million miles a minute thinking about your content, how the audience is receiving the information, managing your visuals…. There’s a lot going on. On top of that, presenting often requires you to speak for several minutes without a break. In conversation, you typically say something, then another person responds; you have more time to regroup. There’s a lot going on as you present. You have to remember your content, manage your visuals, interpret how the audience is receiving the information, and much more. On top of that, presenting often requires you to speak, uninterrupted, for several minutes. In conversation, you typically have a lot of back and forth, giving you more time to breathe and regroup. The more aware you are of the physical skills you need and use to deliver a presentation, the easier it will be to self-evaluate and readjust in the moment. When we present, we often (subconsciously) speak more quickly than we would in conversation. Practice recording yourself delivering your content. Bonus points if you practice in front of a mock audience as this will replicate (on a smaller scale) the feeling of pressure that you would have during the actual presentation. A slower rate of speech can help the audience process your message, especially if the content is complex. Don’t be afraid of it! An added benefit of a slower rate is that when you pause to breathe deeply, you won’t feel that it’s taking an excessive amount of time or creating an unnatural break in your flow. Give yourself enough air to support your speech. When you try to speak with little to no air in your lungs, your body’s tension increases as it tries to squeak out a few more words. The more air you have in your lungs, the longer you can speak comfortably and naturally. Breath support is also what will allow you to project your voice. Increased volume requires increased volume of air. Again, if you slow your rate, keeping it comfortable and easy, it will be no problem to take natural deep breaths as you speak. If you are speaking very quickly, you may find yourself gasping for air. Imagine you’re at the pool. You take a nice, deep breath, plunge your head under the water, and suddenly release all of the air at once. How long can you stay underwater? How comfortable is it? Not very long and not very comfortable, right? After you take your deep breath in, control the release of the air as you speak. If you release the air quickly, you’re back to increased tension as you try to expel more air to get through the remainder of your sentence or thought, or you’re back to taking another breath which can interrupt your flow. Controlled air release is also important for ensuring that the end of your thought is just as clear as the beginning. Don’t let your breath support trail off at the end of a sentence. This can result in a gravelly voice or mumbled speech. Having good breath support will lead to consistent projection, making you sound confident and composed. Practice taking deep breaths and controlling the release of air. See how long you can make one breath last. Don’t be afraid to pause throughout your presentation. The pause is never as long for the audience as it is in your own mind. Sometimes a well-timed pause actually adds value as it allows the audience to process a complex thought or a big idea. Think through your content and plan ahead. Where are the most natural places to pause for a moment to take a breath or regroup? 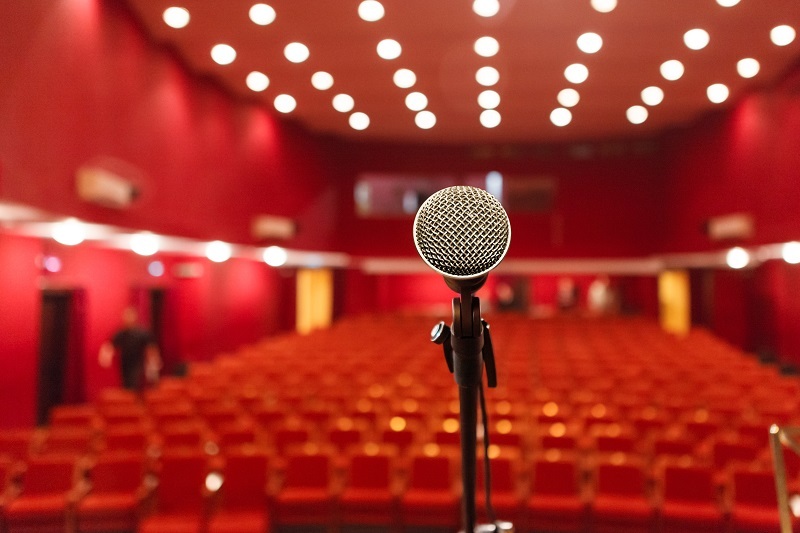 Practice your presentation out loud and record yourself. Listen to your recording and evaluate your breathing, your projection, and your rate of speech. Readjust and practice again until you’ve mastered the art of breathing, breath control, and pausing. About the Author: Jane Rupp owns and runs Voices of the World Speech Therapy, a practice specializing in pronunciation, language, and communication training. Classes are available locally in Austin, Texas as well as online via Skype. Customized communication programs to maximize your professional success. Effective training methods implemented by highly qualified professionals. Get pronunciation tips, tutorials, and relevant news.